I've always wanted to be a real drama queen, but I never worked up the nerve. Sure, I might think about throwing myself on somebody's casket, or standing up to be the one who speaks now at the wedding, instead of forever holding my peace. But the sheepish, shyish weight of my personality made sure those thoughts stayed in my head--or on the page. All of my break-ups- some inevitable, some absolutely explosive- became part of Shadowed Summer's Nan Burkett. She's an attention-hound of the first sort- drinking spiked lemonade in the middle of the day, wearing eye-catching clothes- and showing up to her longtime ex-boyfriend's funeral decked out in full widow gear. Now, I do wonder what happened to my first love from time to time. And I admit, occasionally, I trawl the Internet, trying to figure out where he ended up. I'm happy and settled - but my inner-Nan carries a Havisham torch. She'd definitely stand in a torrential downpour, holding a boombox above her head, trying to get his attention. Fortunately, she only lives on paper, and I'm doing just fine. First love, wherever you are- I promise, you're safe. To read more about Saundra see her Guest Nose post here. 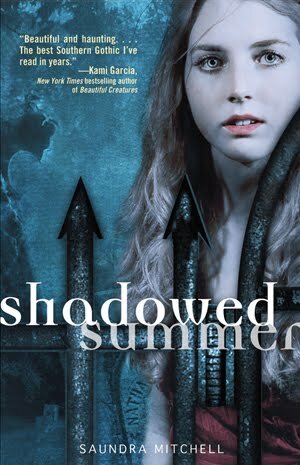 You can also buy your own copy of Shadowed Summer at Amazon or Indiebound. Or you can win a copy! please leave a comment and your contact info by midnight, Tuesday, July 6, 2010. My husband and I are in San Francisco this weekend celebrating our 18th anniversary. 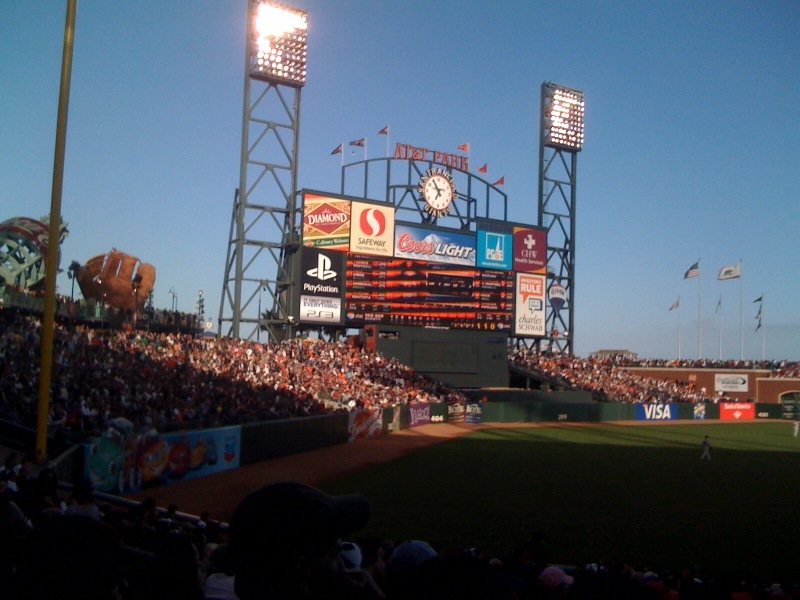 He really wanted to see the Giants play, but knowing that I'm not a huge sports fan, he didn't want to go on our actual anniversary. I said, please buy the tickets. 1. Laugh together every day. It's really hard to remain grouchy after an episode of The Daily Show, or a Snuggie infommercial. 2. Don't blame your partner for your own personal struggles. We've been pretty good about keeping professional stresses, extended family strife, and personal unhappiness out of our marriage. Whether it's been my husband's demanding schooling, or my long, discouraging path toward publishing, I've treated my marriage as an oasis from my other problems. 3. Expect your partner to change. So many of our personal interests, hobbies, likes and dislikes have changed over the years. But here's what hasn't changed: I married an intelligent, kind, compassionate, generous person with a great sense of humor. But the teenager who didn't understand why I hung Monet prints in my dorm room--and that worried me because it didn't fit my "ideal guy" list--is now the one insisting we visit all the museums in San Francisco. So we went to the Giants game--and had a really great time. We sat next to a couple on their first date, and giggled a bit when the girl came back with a hotdog loaded down with onions and sauerkraut. A clear sign that the evening would end in disappointment for that poor guy! 1. What is the dumbest or smartest thing you've done after a breakup? One of the smartest things I ever did was to break up with someone—period. There was this guy I met through work, and we had great chemistry right off the bat. But something about him reminded me of not one but two bad relationships I’d had in the past. Somehow I missed the red flags right there and kept dating him. He got increasingly paranoid and possessive. He tried to catch me in lies (we’d known each other two weeks! ), accused me of flirting with people (sorry, I’m a one-guy girl), and was even talking about when we would get married. In a way, it was flattering that he was so into me, but then the unthinkable happened. I told him about a traumatic experience I’d had, and he said, “Well, maybe it was your own fault.” I’ll spare you the rest of the details, but suddenly I realized how destructive he was. We were out to lunch, and I left him right there. He followed me, but I ducked into a store so that there were people around. He was the kind of person who could become violent, and I was saving myself a lifetime of pain by dumping him now. I’m very glad I did! 2. It's your turn to play Miss Swoon--give us your best relationship advice. I think we tend to seek out people who mirror our opinions of ourselves. If a boyfriend treats us badly, we may believe on some level (though probably not consciously) that we deserve it—otherwise why would we stay with someone like that? This goes for friendships, too. So my advice would be to have a great relationship with yourself before getting into a relationship with someone else. You’ll be much more likely to attract a person who respects you and cares about you for something that will last. 3. If you could go on a date with any fictional character, who would it be? In the five years since her bad-girl sister Xanda’s death, Miranda Mathison has wondered about the secret her sister took to the grave, and what really happened the night she died. Now, just as Miranda is on the cusp of her dreams—a best friend to unlock her sister’s world, a ticket to art school, and a boyfriend to fly her away from it all—Miranda has a secret all her own. Then two lines on a pregnancy test confirm her worst fears. Stripped of her former life, Miranda must make a choice with tremendous consequences and finally face her sister’s demons and her own. In this powerful debut novel, stunning new talent Holly Cupala illuminates the dark struggle of a girl who must let go of her past to find a way into her future. To win a copy, please leave a comment & your contact info by midnight, Tuesday, June 29, 2010. Skaputziner is the winner of Change of Heart! Talk to you next week! When I was eighteen, I was up at sleepaway camp, thrilled to be together with my boyfriend after spending most of the school year in different states. We had waited all year for camp and were enjoying our summer. Until he tore his meniscus, cartilage in his knee, and needed to go home for surgery. A misplaced soccer kick had ruined all of our plans. I moped around camp while back at home he was having his knee repaired. My boyfriend was not to be deterred and didn’t want to blow our time together, so a few days after the surgery, he came back to camp with a cast from his ankle to his waist. Like a trouper, he crutched around camp, trying to supervise his campers and trying to hang out with me as much as possible. I thought everything was great until we had a day off and went to Albany with a group of fellow counselors. My boyfriend was a little grumpy, but I chalked it up to the discomfort from the giant cast. During a quiet moment in the trip, the two of us were walking separately from the group and I asked him what was up. With tears in his eyes, he told me he was horribly jealous of all the guys I had been hanging with while he was away (yes, you read earlier that I was miserable the whole time he was away—there was no flirting and hooking up with anyone, only pining for him). He couldn’t get past this jealousy and wanted to break up with me. What?!! He wanted to break up with me because he liked me so much he was jealous of other guys? What kind of warped logic was that? I burst into tears and told him there was no way I was letting him break up with me, giving him a deep, long kiss that had to have made my intentions clear. Every once in a while, I’ll turn to him as we’re sitting on the couch in our house, watching our three kids running around, and remind him he almost blew it! Aw... Aren't they cute?!? Thanks for the happy ending Shari! When you’re 16 years old, it never occurs to you that you might die. Emmi Miller’s got a fabulous life. She has tons of friends, does great in school and is an all-star soccer player who played in Europe last summer. It even looks like Sam Hunter, a totally cute baseball player, might be interested in her. And then she gets a virus. No biggy, right? Until the virus goes to her heart and weakens it so much that, without a transplant, Emmi will die. Will Emmi get a heart in time? Is Sam too good to be true? What about her new friend Abe, who has also had a transplant and guides her through these scary times — is he just being supportive or is there more going on between them? And will Emmi realize it before it’s too late? To win your own copy of Shari's novel, please leave a comment by midnight, Tuesday, June 22, 2010. Open to anyone, anywhere in the world. 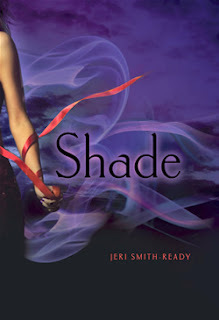 Kimberly B. was chosen at www.random.org to win a copy of Shade by Jeri Smith-Ready! This week I managed to sneak away to various cafes to add another 4,000 words to my story. I also did a bit of rewriting, something I usually don't do while working on a first draft, but since I'm not working on a deadline or trying to earn a NaNoWriMo certificate, I figured I had the luxury of taking my time. If you're reading this on Facebook go to www.mybignose.blogspot.com to see the video. Okay, I'm off to start Chapter Six! …"Get off my shoulders and let me see." He was looking at it, as he jumped off my shoulders. "It looks like an old journal", Jackie said. "Maybe it says journal on it!" “Let’s look inside the cover, I suggested.” It says, Drake 4824 E. 4900 W.” “That's where we live." "He must have lived here too!" "Tracey! Jackie!" mom called. "Come down for dinner!" "We're coming mom!" I yelled back. As we were going to the stairs I told Jackie not to tell anyone about the journal. At the stairs, we met up with Lissy, she's our 5 year old little sister. She has freckles on her nose, and sometimes stubborn short brown hair, but cute. Some people say she looks like an angel, but I don't care. Her nick-name is Izy. "We’re having pizza!" Lissy said. It's her favorite food, my favorite food is a lot better, corn-on-the-cob, it's so delicious! "What did you kids do today?" mom asked. "I played Barbie’s with Sarah," Lissy said, in her cute little way. "What about you two?" mom asked. "Well, we cleaned our rooms," I said. Then Jackie interrupted, "We also took a nap." After we finished dinner, we went upstairs to read more of the journal. Aren't you completely intrigued? Great job, Emily. Keep writing!!!! I tried writing several breakup stories, but looking back, most of my relationships make me sound either feeble or evil. Like my first boyfriend, a high school dropout who shoplifted my birthday gifts, ridiculed my virginity, and eventually wandered off in search of fresh prey. Or Boyfriend #5, who left me for Jesus. Or Boyfriends 2, 3, 6, 7, and 8, whom I left for, well, in most cases, the next number on the list. If you can count, you’ll notice I omitted Boyfriend #4. For privacy’s sake, let’s call him “Dude,” because that’s what he called everyone else. Dude was a skateboarder back before skateboarding was cool—in fact, I’m pretty sure we singlehandedly kept it from being cool. Dude collected more styling products in one year than I have had in my entire life. Dude dumped me about an hour before I was going to dump him. (With breakups, as with comedy, timing is everything.) I’d felt so guilty about wanting to leave him, thinking I would ruin his summer, that I’d been extra sweet and attentive, calling him every day during break. Looking back, this behavior probably drove him away that much faster. Oh well. When sophomore year started two months later, Dude and I were inseparable friends, with none of the bickering and baggage that had plagued our former relationship. This really confused the people we hung out with, who assumed we were secretly hooking up. Nope. We had just discovered that we liked each other better this way. Plus, Dude did wonders for my hair. Love ties them together. Death can't tear them apart. Best. Birthday. Ever. At least, it was supposed to be. With Logan's band playing a critical gig and Aura's plans for an intimate after-party, Aura knows it will be the most memorable night of her boyfriend's life. She never thought it would be his last. Logan's sudden death leaves Aura devastated. He's gone. Like everyone born after the Shift, Aura can see and hear ghosts. This mysterious ability has always been annoying, and Aura had wanted nothing more than to figure out why the Shift happened so she can undo it. But not with Logan's violet-hued spirit still hanging around. Because dead Logan is almost as real as ever. Almost. It doesn't help that Aura's new friend Zachary is so understanding--and so very alive. His support means more to Aura than she cares to admit. As Aura's relationships with the dead and the living grow ever complicated, so do her feelings for Logan and Zachary. Each holds a piece of Aura's heart...and clues to the secret of the Shift. To win your own copy of Shade, please leave a comment by midnight, Tuesday, June 15, 2010. 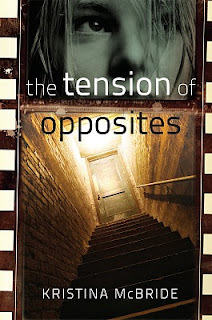 Bobbie is the winner of The Tension of Opposites by Kristina McBride. Yay!!! Writing a new WIP over the summer when school is out can be tricky for me--and I often have to resort to bribery (here's a frappuccino, don't talk to me for an hour), sneakiness (um, yeah, I'll see you guys in a little while *runs to Starbucks*), and working in short bursts (everyone's ignoring me, let's see if I can sneak in a paragraph or two). Okay, I'm off to my writing group! See you next time. I love learning about the world--and wish I could travel and explore every nook and cranny of our amazing planet. Today Cindy Vine tells us about her experience in Tanzania. “Wow, exotic location,” you’ll drawl languidly. The thing is, Tanzania might be an exotic location to visit for a holiday, staying in luxury lodges, flying everywhere, but living there is something entirely different. Like other developing countries in Africa, Tanzania is a bit like living in the wop-wops. It is not for the faint-hearted, and it is definitely not a National Geographic experience. You’ll be surprised how many people come here to work imagining it’ll be like living on the Out of Africa movie set. They soon realise with shock and horror, that the realities of living here is nothing like they witnessed Meryl Streep do in Out of Africa. For starters, Out of Africa never showed the ants of all shapes and sizes who invade everything. Nothing is precious in your home. Then there are the geckos who catch mosquitoes on the wall next to your chair in the living room. Malaria, Amoebas and Giardia take over your body. Potholes the size of a volcanic crater, and speed bumps every few kilometres, roadblocks with corrupt policemen, all meet you when you leave the safety of your home. The cost of living is so expensive as everything is imported. Frequent power cuts disrupt your life as not only are you forced to go to bed at 7am when it gets dark, but you can’t have a hot shower. Scratch that. You can’t pump water to have a shower. When you do have power, the internet is sometimes so slow carrier pigeons would deliver your emails much faster. Local people think that as a mzungu, you are a walking ATM and will try and get away with charging you triple what they would charge the locals. Many people who come here to work, and who expect the glamour of Hollywood’s Out of Africa, are bitterly disappointed. They never get over their disappointment, it affects their work and all they see are the negative parts of living here, which I have so kindly pointed out to you. Living here is hard, but also enjoyable, I wouldn’t swop it for anything else. You either hate it or love it. Generally, those loving lattes in Starbucks hate it. Tanzania is the fifth African country I’ve lived in. It’s also the poorest by far. I’ve also lived in New Zealand, Korea, Thailand and China. Having grown up in South Africa, I’m pretty much an African expert. A fundi is what they call experts here. I love it when I can see Mount Kilimanjaro, the highest walkable mountain in the world at 5895m, peeping out through the clouds. I get excited when I see fresh snow on her summit. Driving through the Serengeti, Ngorongoro Crater and seeing herds of zebra, wildebeest, elephants, lions. Snorkelling in the clear waters of the Indian Ocean. And of course, there’s the people. As corrupt as many of them are, I still love them. These are the positive things to focus on, when you can’t get in touch with your family because the mobile network is down, or the internet is not working. Every country has its negatives and positives and we choose which ones to focus on. Living here I have come across incessant complainers, whiner-babies, as well as people who have developed such a heart for Africa. They look for the good, and how they can help to make it better. My lush garden filled with mango, papaya, lime and avocado trees, where whatever you plant starts growing the same day, is a refuge. It’s the middle of winter and I’m still wearing summer clothes. This is the kind of a place where you want to raise your children, where going to work is a pleasure and you are inspired to write. There is so much to write about. When I drive long distances, I try and write descriptions of all I see in my head. Spectacular scenery, interesting people. Moving back to Africa, is the best thing I could have done. But, not all of us are alike, and many people struggle with the way of life here. If you do get a chance to travel here, either for a holiday or for a job, do your research first. Contact people who live there. That way, you won’t get such a culture shock when you arrive. Everybody should travel to Africa at least once before they die. Now, get online and book your ticket! 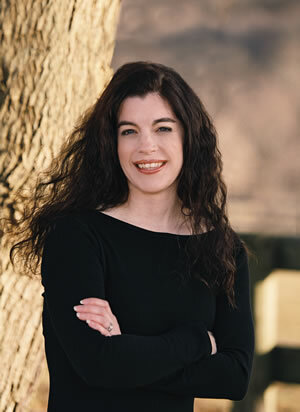 Today I'm happy to welcome Kristina McBride, author of the debut novel The Tension of Opposites. Leave a comment to win a copy! 10. A weekend of mourning where you allow yourself to wallow in snot, tears, and complete misery. 9. A comfy pair of PJ’s to shuffle around in during said weekend of mourning. 8. Pounds of chocolate. Pick your poison: M&M’s, Hershey Kisses, Hershey Bar. Just eat it. 7. Three tear-jerking girl flicks and a few boxes of Kleenex. Cry it out. It’ll be good for you. 6. Some time with your BFF. Her main goal should be to get you to laugh out loud at least five times. 5. More chocolate (Fresh-baked chocolate chip cookies or iced brownies might be good at this point.). 4. A shoebox to hide away all your memories; you’re officially forbidden from having them on display. If an item doesn’t fit in the shoebox, pitch it. 3. A little more chocolate (Maybe start formulating your new work-out routine while you eat this batch. Don’t ever allow a man to affect your figure!). 2. A few deep breaths. It’s been two years since Noelle disappeared. Two years since her bike was discovered, sprawled on a sidewalk. Two years of silence, of worry, of fear. For those two long years, her best friend Tessa has waited, living her own life in a state of suspended animation. Because how can she allow herself to enjoy a normal high school life if Noelle can’t? How dare she have other friends, go to dances, date boys, without knowing what happened to the girl she thought she would share everything with? And then one day, someone calls Noelle’s house. She’s alive. 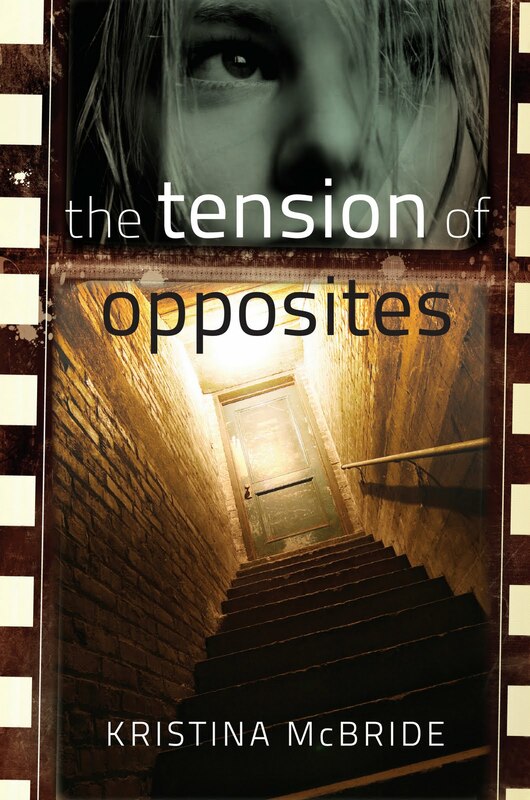 A haunting psychological thriller taken straight from the headlines, The Tension of Opposites is a striking debut that explores the emotional aftermath of a kidnapping on the victim, and on the people she left behind. To win your own copy of The Tension of Opposites tell me one of your breakup essentials (it's okay if you borrow one of Kristina's). Contest ends at midnight, Tuesday, June 8, 2010. Cheryl Renee Herbsman is the winner of a copy of Faithful by Janet Fox. Yay!! !